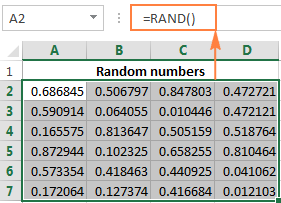 The tutorial explains the specificities of the Excel random number generator algorithm and demonstrates how to use RAND and RANDBETWEEN functions to generate random numbers, dates, passwords and other text strings in Excel. Before we delve into different techniques of generating random numbers in Excel, let's define what they actually are. In plain English, random data is a series of numbers, letters or other symbols that lacks any pattern. Randomness has a variety of different applications in cryptography, statistics, lottery, gambling, and many other fields. And because it has always been in demand, various methods of creating random numbers have existed since ancient times, such as flipping coins, rolling dice, shuffling playing cards, and so on. Of course, we won't rely on such "exotic" techniques in this tutorial and focus on what Excel random number generator has to offer. Although the Excel random generator passes all standard tests of randomness, it does not generate true random numbers. But don't write it off immediately :) Pseudo-random numbers produced by the Excel random functions are fine for many purposes. Let's take a closer look at the Excel random generator algorithm so that you know what you can expect from it, and what you cannot. Like most computer programs, Excel random number generator produces pseudo-random numbers by using some mathematical formulas. What it means for you is that, in theory, random numbers generated by Excel are predictable, provided that someone knows all the details of the generator's algorithm. This is the reason why it has never been documented and will hardly ever be. Well, what do we know about the random number generator in Excel? The Excel RAND and RANDBETWEEN functions generate pseudo-random numbers from the Uniform distribution, aka rectangular distribution, where there is equal probability for all values that a random variable can take on. A good example of the uniform distribution is tossing a single die. The outcome of the toss is six possible values (1, 2, 3, 4, 5, 6) and each of these values is equally likely to occur. For a more scientific explanation, please check out wolfram.com. In early Excel versions, prior to Excel 2003, the random generation algorithm had a relatively small period (less than 1 million nonrecurring random number sequence) and it failed several standard tests of randomness on lengthy random sequences. So, if someone still works with an old Excel version, you'd better not use the RAND function with large simulation models. If you are looking for true random data, you can probably use a third-party random number generator such as www.random.org whose randomness comes from atmospheric noise. They offer free services to generate random numbers, games and lotteries, color codes, random names, passwords, alphanumeric strings, and other random data. Okay, this quite lengthy technical introduction ends and we are getting to practical and more useful things. The RAND function in Excel is one of the two functions specially designed for generating random numbers. It returns a random decimal number (real number) between 0 and 1. RAND() is a volatile function, meaning that a new random number is generated every time the worksheet is calculated. And this happens every time you perform any action on a worksheet, for example update a formula (not necessarily the RAND formula, just any other formula on a sheet), edit a cell or enter new data. The RAND function is available in all versions of Excel 2016, Excel 2013, Excel 2010, 2007, 2003, XP, and 2000. And now, let's take a step further and write a few RAND formulas to generate random numbers according to your conditions. Note. The upper bound value is never included in the returned random sequence. For instance, if you want to get random numbers between 0 and 10, including 10, the right formula is =RAND()*11. Where A is the lower bound value (the smallest number) and B is the upper bound value (the largest number). Note. This random formula will never return a number equal to the largest number of the specified range (B value). 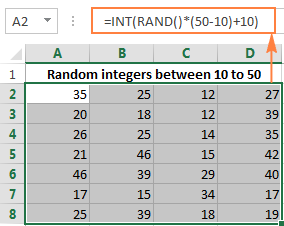 To make the Excel RAND function produce random integers, take either of the above mentioned formulas and wrap it in the INT function. Obviously, bottom is the lowest number and top is the highest number in the range of random numbers you want to get. Like RAND, Excel's RANDBETWEEN is a volatile function and it returns a new random integer every time your spreadsheet recalculates. The RANDBETWEEN function is available in modern versions of Excel 2016, Excel 2013, Excel 2010, and Excel 2007. In earlier versions, you can use the RAND formula demonstrated in Example 3 above. Further on in this tutorial, you will find a few more formula examples demonstrating how to use the RANDBETWEEN function to generate random values other than integers. 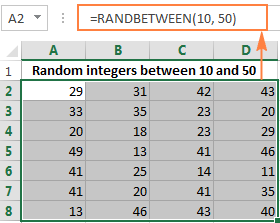 Though the RANDBEETWEEN function in Excel was designed to return random integers, you can force it to return random decimal numbers with as many decimal places as you want. For a number of advanced options such as generating random weekdays or weekends, check out Advanced Random Generator for dates. To return random times according to your criteria, more specific random formulas are required, as demonstrated below. Where A is the first character and the Z is the last character in the range of letters you want to include (in alphabetical order). CODE returns numeric ANSI codes for the specified letters. RANDBETWEEN takes the numbers returned by the CODE functions as the bottom and top values of the range. CHAR converts random ANSI codes returned by RANDBETWEEN to the corresponding letters. Note. Since, the ANSI codes are different for UPPERCASE and lowercase characters, this formula is case-sensitive. If someone remembers the ANSI Character Codes Chart by heart, nothing prevents you from supplying the codes directly to the RANDBETWEEN function. To insert a random special character, such as ! " # $ % & ' ( ) * + , - . /, use the RANDBETWEEN function with the bottom parameter set to 33 (ANSI code for "!') and the top parameter set to 47 (ANSI code for "/"). To create a random text string in Excel, you just have to concatenate several CHAR / RANDBEETWEEN functions. RANDBETWEEN(0,9) - returns random numbers between 0 and 9. CHAR(RANDBETWEEN(65,90)) - returns random UPPERCASE letters between A and Z.
CHAR(RANDBETWEEN(97, 122)) - returns random lowercase letters between a and z.
CHAR(RANDBETWEEN(33,47)) - returns random special characters. The text strings generated with the above formula would be something like "4Np#" or "2Yu&". A word of caution! If you use a similar formula to create random passwords, they won't be strong. Of course, there's nothing saying you can't generate longer text strings by chaining more CHAR / RANDBETWEEN functions. However, it's impossible to randomize the order or characters, i.e. the 1st function always returns a number, the 2nd function returns an uppercase letter and so on. 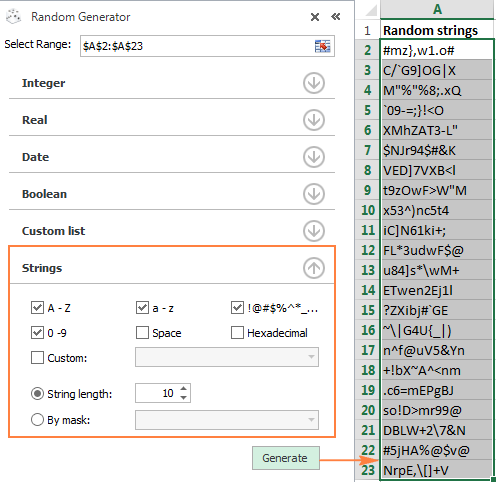 If you are looking for an advanced random password generator in Excel capable of producing text strings of any length and pattern, you may want to check out the capabilities of Advanced Random Generator for test strings. Also, please keep in mind that the text strings generated with the above formula will change every time your worksheet recalculates. To ensure that your strings or passwords remain the same once they are created, you will have to stop the RANDBETWEEN function from updating the values, which leads us directly to the next section. To stop the RAND or RANDBETWEEN functions from recalculating in one cell, select that cell, switch to the formula bar and press F9 to replace the formula with its value. To prevent an Excel random function from automatically updating values in several cells, use the Paste Special Select all the cells with the random formula, press Ctrl + C to copy them, then right click the selected range and click Paste Special > Values. Alternatively, you can press Shift + F10 and then V, which is the shortcut for the "Paste special >Values" option. To learn a few more techniques to "freeze" random numbers, see How to replace formulas with their values in Excel. Use the RAND or RANDBETWEEN function to generate a list of random numbers. Create more values than you actually need because some will be duplicates to be deleted later. Convert formulas to values as explained in How to prevent Excel random function from recalculating. Remove duplicate values by using either Excel's built-in Duplicate Remover (Data tab > Remove Duplicates) or our advanced Duplicate Remover for Excel. Now that you know how to use random functions in Excel, let me demonstrate you a faster, easier and formula-free way to create a list of random numbers, dates or text strings in your worksheets. 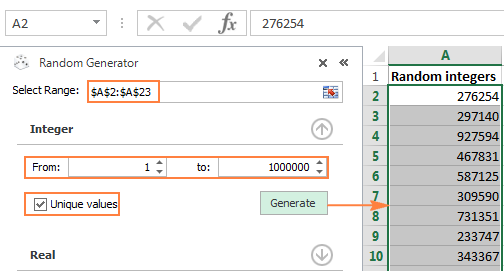 AbleBits Random Generator for Excel was designed as a more powerful and user-friendly alternative to Excel's RAND and RANDBETWEEN functions. It works with all versions of Microsoft Excel 2016, 2013, 2010, 2007 and 2003 equally well and addresses most of the quality and usability issues of the standard random functions. Before showing our Random Generator in action, let me provide a few key notes on its algorithm so that you know exactly what we are offering. AbleBits Random Number Generator for Excel is based on the Mersenne Twister algorithm, which is considered an industry standard for high-quality pseudo randomization. We use version MT19937 that produces a normally distributed sequence of 32-bit integers with a very long period of 2^19937 - 1, which is more than sufficient for all imaginable scenarios. Random numbers generated using this method are of a very high quality. The Random Number Generator has successfully passed multiple tests for statistical randomness, including the well-known NIST Statistical Test Suiteand Diehard tests and some of TestU01 Crush randomness tests. Unlike Excel random functions, our Random Number Generator creates permanent random values that do not change when a spreadsheet recalculates. And now, let's see the Random Number Generator in action, as promised. 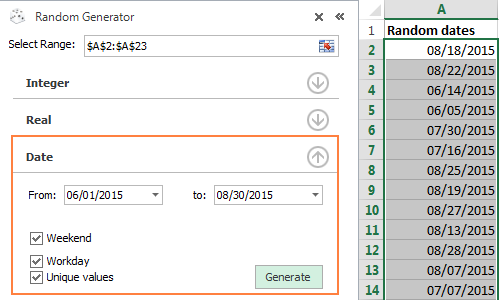 With AbleBits Random Number Generator, creating a list of random numbers is as easy as clicking the Generate button. All you have to do is select the range to be populated with random integers, set the bottom and top values and, optionally, check the Unique Values box. In a similar manner, you can generate a series of random decimal numbers in the range that you specify. Generate random dates for a specific time period - you enter the bottom date in the From box and the top date in the To box. Include weekdays, weekends, or both. Apart from random numbers and dates, with this Random Generator you can easily create random alphanumeric strings with certain character sets. The maximum string length is 99 characters, which allows generating really strong passwords. A unique option provided by AbleBits Random Number Generator is creating random text strings by mask. This is a very useful feature for generating globally unique identifiers (GUID), zip codes, SKUs, and so on. If you are interested to give our Random Generator a try, you are most welcome to download a fully functional trial version. And if you like the tool, you can purchase it as a separate product or as part of our Ultimate Suite for Excel, which is a collection of 60+ professional tools for Excel. Either way, we will happily offer you the 15% off coupon code that we've created especially for our blog readers: AB14-BlogSpo. If someone wants to have a closer look at the functions and formulas discussed in this tutorial, feel free to download the Sample workbook with random formula examples. Thank you for reading! 33 Responses to "How to generate random numbers in Excel - RAND and RANDBETWEEN functions"
from each day I need to generate one randon time from all times I have. Is the specific method of generating RAND() in Excel known, or is it a black box? In other words, how random is RAND()? The RAND function generates pseudo-random numbers from the Uniform distribution, aka rectangular distribution, where there is equal probability for all values that a random variable can take on. Do you know how to change the root of the generator? has excell a simple method to do that? thanks. If you mean the randomization algorithm, it cannot be changed. That's why we created Random Generator for Excel - to use a different reliable algorithm. I want to generate a lotto chart of 1 - 90 in 5 unrepeated rows involving all numbers such that every winning result of 5 numbers must comform with at least one possible and correct row. When I say '5 rows', I mean as many times as posible for each number in the ninety numbers. i am working on a norm.inv(rand(),Mean,Std dev) using these mean and deviation values to generate my random number. however, the deviation may bring the value across 0, negative, which is not possible for my needs. is it possible to put a bounds (randbetween) while still asking it to use the mean and dev. to create the number? I need random incremental decimal values in a range. and from row 1 to row 300. 3 cells wide 100 down that have my own numbers that don't change. 3 cells wide beside it and 100 down as well but random numbers between 1 and 20 "no decimals"
Very nice article. Note that from Excel 2010 onwards, Excel RAND() function uses the Mersenne Twister algorithm. Trying to randomize the 55- 2 digit combinations for 0-9. For example: 0,0 0,1 and so on through 9,9. 0,1 and 1,0 are considered the same combo. Gotta be easier than 55 slips of paper?? Can you help? Hi, is there a possible way to combine the randbetween function with current day. In other words use a random number with current day to create an unique number using only the year and the day only. Thanks! Use Rnd(-N) to generate a reproducible number. Feed the previous results as a negative number to the succeeding Rnd calls, x1=RND(-Seed); x2=RND(-x1) etc.. to produce a repeatable sequence from a seed number. 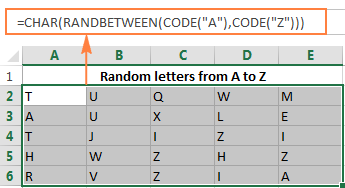 Right, in Excel VBA you can initialize a random sequence using Rnd(-N), but as noted in the tutorial, it cannot be done with the regular worksheet functions RAND or RANDBETWEEN. Or course, you can create your own user-defined function that will use RND to generate reproducible numbers. Hi, Would you please help me find the correct formula to generate a random number between 1500 and 4000 which ends in a zero (either round up or down, doesnt matter). You can find more about ROUND function here. I have a small VBA code setup to generate 4 random integers (using INT (RAND()*(10-1)+1) ) between 1 and 10 every time I push a button on the worksheet. What I noticed is that every time I open the spreadsheet it cycles through the same order of numbers. Meaning the first time I click the button I'll get the same 4 random numbers, the second time I push the button I'll get the same set of numbers I got the last time I opened the sheet and presssed it twice. I have a list of Latitude and Longitude values in excel, is there a way to build a script that will take the column of data and randomize the last 2 digits past the decimal? This would in effect jitter the points by a few meters, and keep points from all falling on top of each other on a map. Anyone know how to accomplish this? Hi there, i want to generate random number between 2 number in decimal point form (between 0.1 and 0.6), but always got value of 1. Is there any possible way to make the random number generate between these 2 values? Hello can you please help me to find the next number in Random Number Generator when the last numbers was 351 and 610 then what is the next number? please help me. Nice information about randam password generator. c) are they both suitable? Is something like this what you want? The lowest value is 1.3, the highest value is 5 and the numbers will be decimal numbers. This idea is discussed in the above article. You can format the cells as numbers to show one decimal place. Is there a way to use the RAND function with exceptions? I want to generate random numbers between 93 and 118 but they can not include 103 or 114. (Also each number can only appear a maximum of twice per row). Is there a better function to use?